Daviess County (/ˈdeɪvɪs/ "Davis"), is a county in the U.S. state of Kentucky. As of the 2010 census, the population was 96,656. 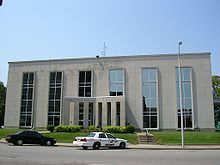 Its county seat is Owensboro. The county was formed from part of Ohio County on January 14, 1815. Daviess County was established in 1815. The county is named for Major Joseph Hamilton Daveiss (a recording error in the State Clerk's office accounts for the error in spelling, which was never corrected), the United States Attorney who unsuccessfully prosecuted Aaron Burr. The county's borders were altered in 1829 to form Hancock County, in 1830 to absorb a small area surrounding Whitesville, in 1854 to cede land to McLean County, and finally in 1860 to annex 44 square miles (110 km2) from Henderson County. The courthouse was burned in January 1865 during the American Civil War, but because the county records had been transferred to a church they were spared destruction. As of the census of 2012, there were 97,847 people, 36,033 households, and 24,826 families residing in the county. The population density was 198 per square mile (76/km2). There were 38,432 housing units at an average density of 83 per square mile (32/km2). The racial makeup of the county was 93.69% White, 4.35% Black or African American, 0.13% Native American, 0.43% Asian, 0.02% Pacific Islander, 0.44% from other races, and 0.94% from two or more races. 0.92% of the population were Hispanic or Latino of any race. In the county, the population was spread out with 25.80% under the age of 18, 9.00% from 18 to 24, 28.40% from 25 to 44, 23.00% from 45 to 64, and 13.80% who were 65 years of age or older. The median age was 37 years. For every 100 females, there were 92.60 males. For every 100 females age 18 and over, there were 88.30 males. Daviess County has long had a reputation as the leading center of the production of distilled spirits, chiefly Kentucky bourbon. Walter McFarland, who moved here from North Carolina, began making whiskey and peach brandy in about 1804 on a 200-acre (0.81 km2) estate just south of Panther Creek, on today's U.S. 431. Cornelius Westerfield also began distilling corn whiskey in the early 1800s on his farm three miles (4.8 km) southwest of Whitesville, Kentucky, on Deserter Creek. It finally closed in 1872, after more than 60 years of production. ^ Rennick, Robert M. (1987). Kentucky Place Names. University Press of Kentucky. p. 78. Retrieved 2013-04-28. ^ Hogan, Roseann Reinemuth (1992). Kentucky Ancestry: A Guide to Genealogical and Historical Research. Ancestry Publishing. p. 223. Retrieved 26 July 2013. This page was last edited on 10 April 2019, at 21:27 (UTC).